small oil sketch painted crouching in the bracken looking north across the Howgill fells, 6×8 inches on canvas. 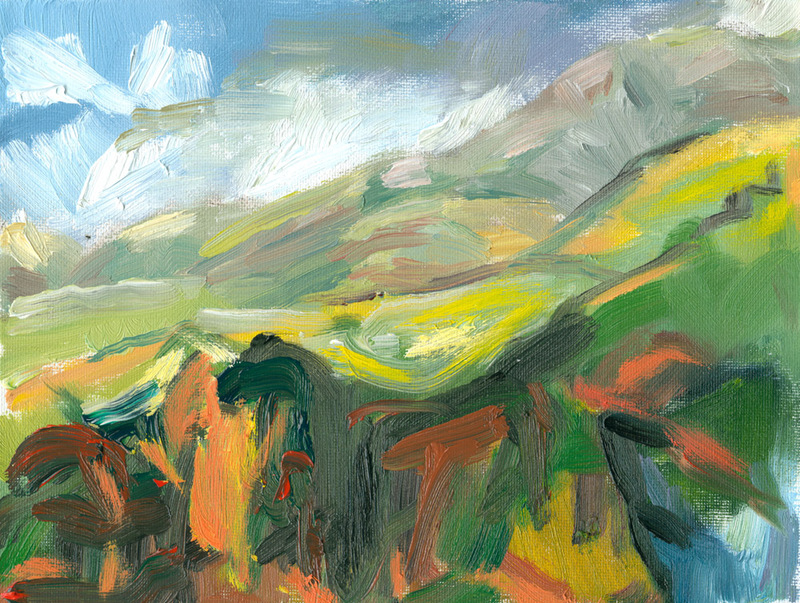 Summer became a bit abstract … at least while painting in the hills. Maybe the real hills lost their appeal or I couldn’t hear them calling any more. 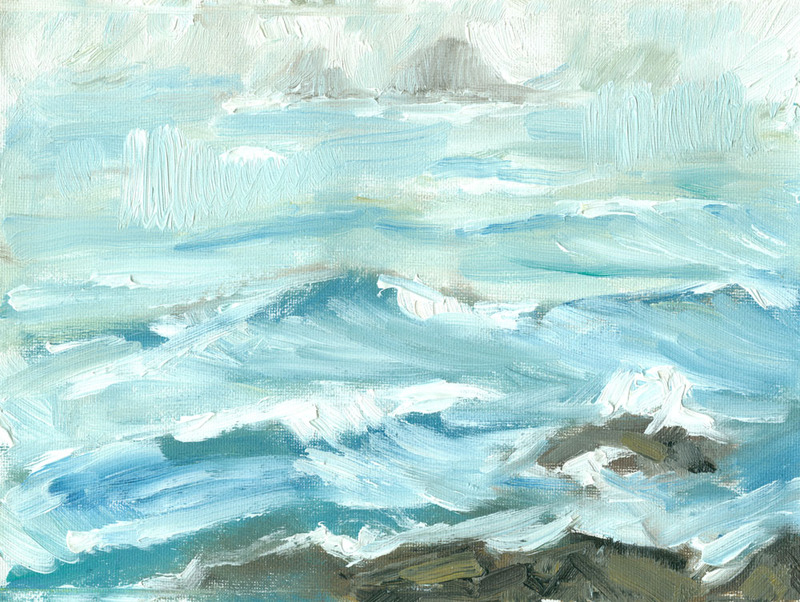 After Cornwall the sea has been in my ears and a September visit to Skye with unexpectedly lovely weather meant that afternoons and, even better, evenings could be spent perched on the rocks wrestling with slippery oil paints while the silvery light took on pale colours. The first pictures were sketchy but the paintings changed as the days went on, leaving me a bit exasperated that I had to stop at the end of a week spent getting going. The sea project will be continued though. 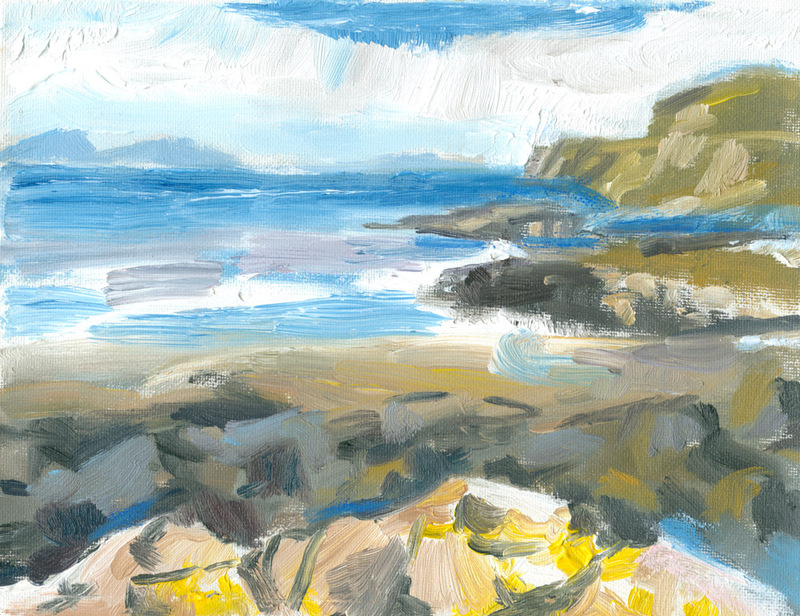 plein air sketch in oils carried out while sitting on the shore of Loch Pooltiel, Skye. Oil on canvas, 6×8 inches. 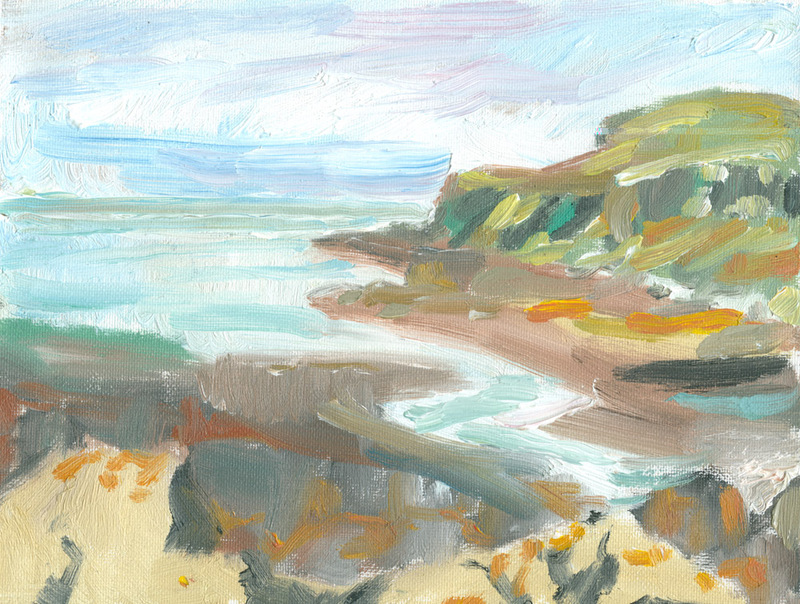 another go at painting Loch Pooltiel from the shore, 6×8 inches, oil on canvas. Back at home our flat seemed to have developed its own affinity for water as the walls became damper and the atmosphere more dank. In October it was too cold to move around and the backs of some of my canvases were suspiciously mottled. Perhaps the sea business was going too far? It felt like it had invaded the fabric of my living space. Some kind of balance was required. I bought a small robot machine, a dehumidifier, and set it humming away to itself in the heart of the flat. 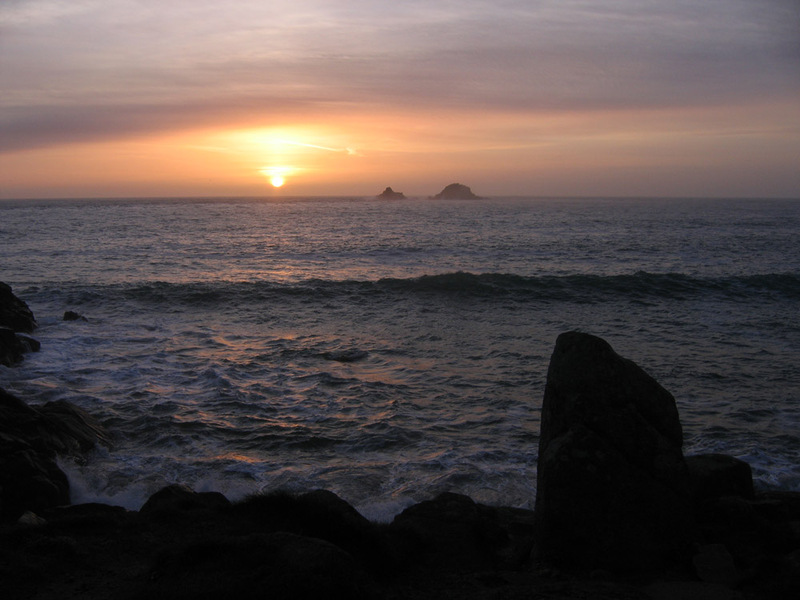 It seemed to draw the sea into itself and I emptied waves of crashing water down the sink every evening. The Cornwall and Skye paintings looked brighter on their respective walls and the air felt warmer and more pleasant. the first colours of the sunset reflected in Loch Pooltiel on a pale silver evening, 6×8 inches in oils on canvas. 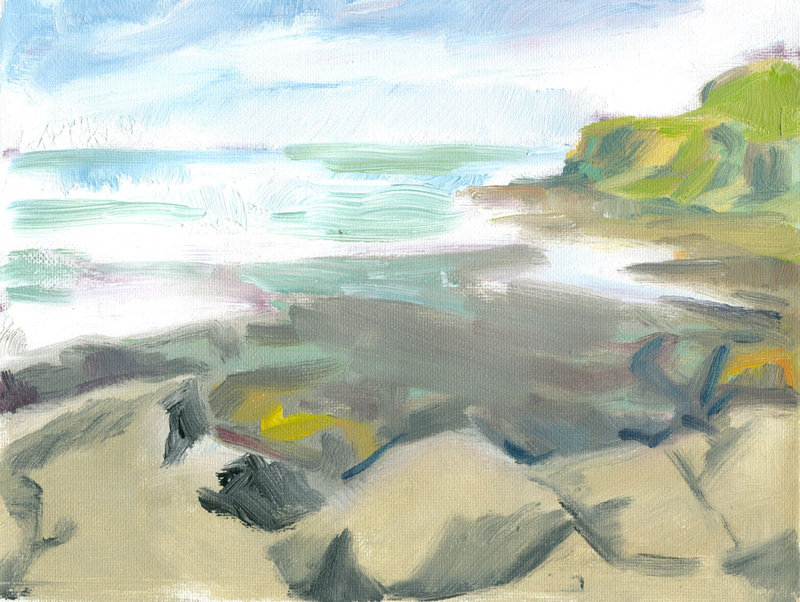 Loch Pooltiel painted in the warmth of a sunny day, sitting on the rocks, oil on 6×8 inch canvas. swelling waves at sunset. 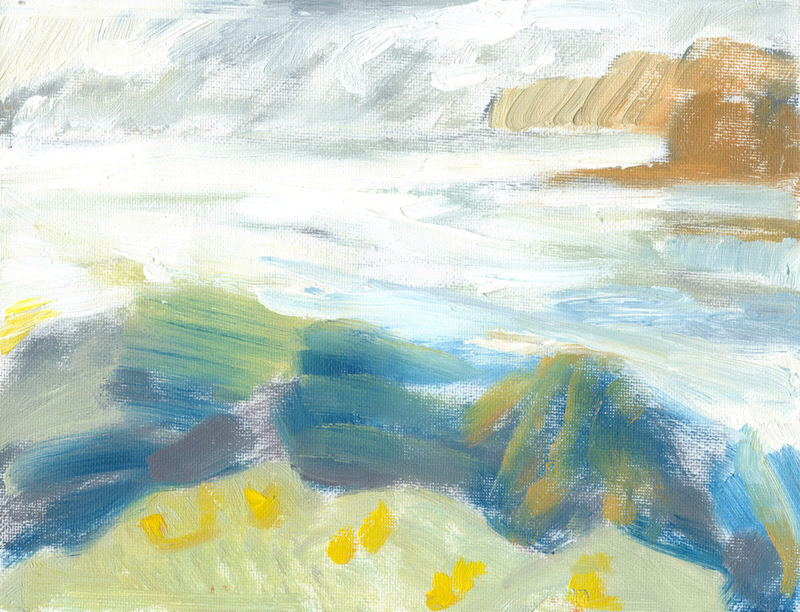 Oil on canvas, 6×8 inches, painted from the rocks at Loch Pooltiel. 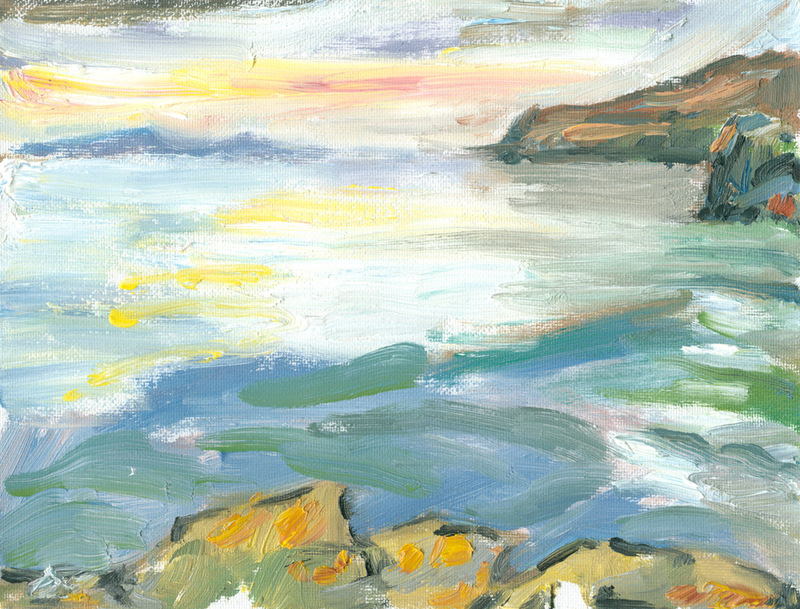 a second attempt to capture Loch Pooltiel’s waves at sunset, oil on canvas, 6×8 inches. 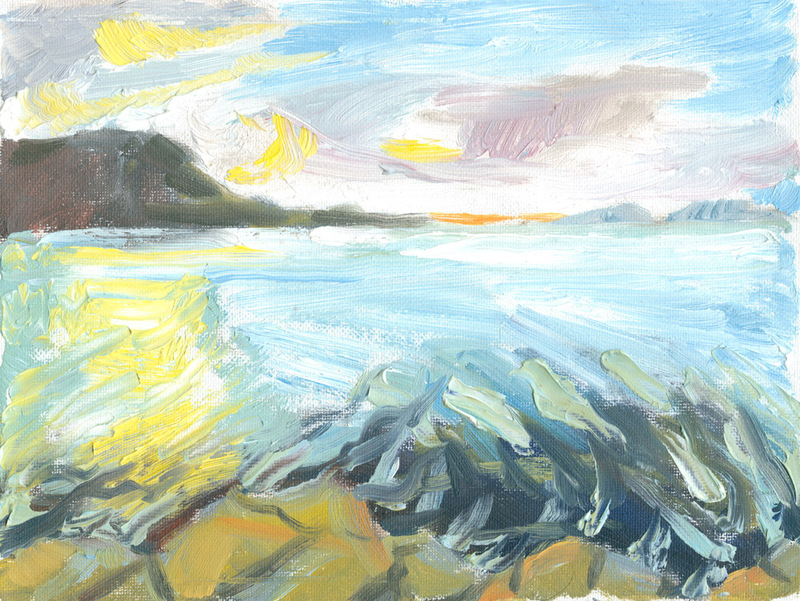 Loch Pooltiel painted from the rocks before sunset, oil on 6×8 inch canvas. So where is the sea? In Cornwall, in Skye, in my mind or inside a whirring water collector? Maybe all of these places. It certainly hasn’t gone away and the sketches feel as if they are leading somewhere. A large canvas is taking shape on the easel but it feels, at the moment, as if it’s treading water. 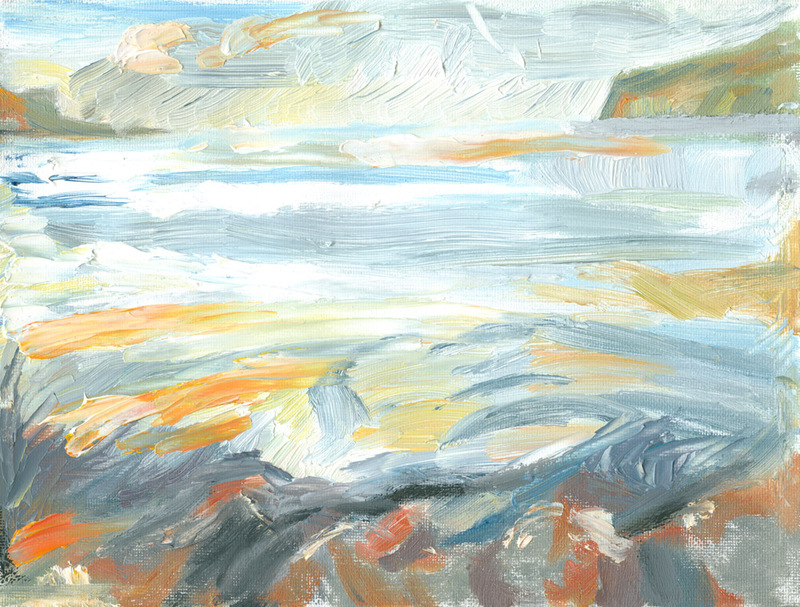 a final, hurried attempt to sketch the scene in the silvery evening light of Loch Pooltiel. Oil on canvas, 6×8 inches. 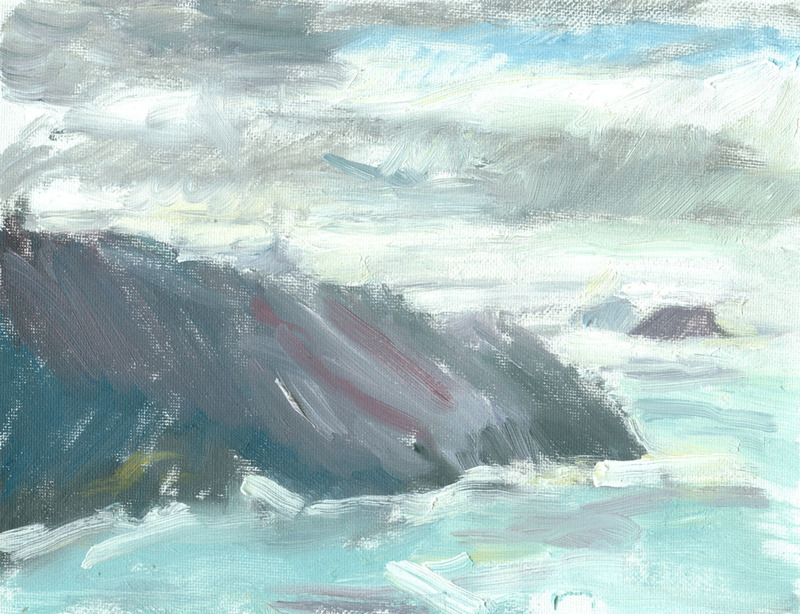 This entry was posted in Isle of Skye, paintings, plein air, the sea and tagged abstract Howgills, dehumidifier, Howgill Fells oil sketch, Howgills plein air, Isle of Skye, Loch Pooltiel, oil sketches plein air, painting the sea, painting waves, plein air sea paintings, plein air seascapes, plein air waves, sea paintings, the sea, waves on November 30, 2017 by fellpainter. In Cornwall where the landscape seems filled with the energies of invisible beings there are some strange sights to be seen, especially on the cliffs. 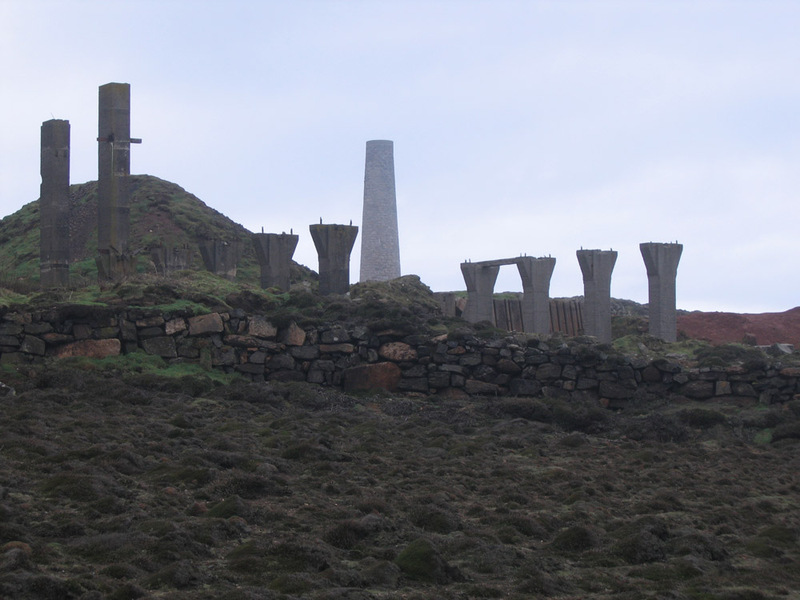 Recent man made structures, tin mines and the like, have been weathered by nature into something resembling an outdoor sculpture park for modern art. 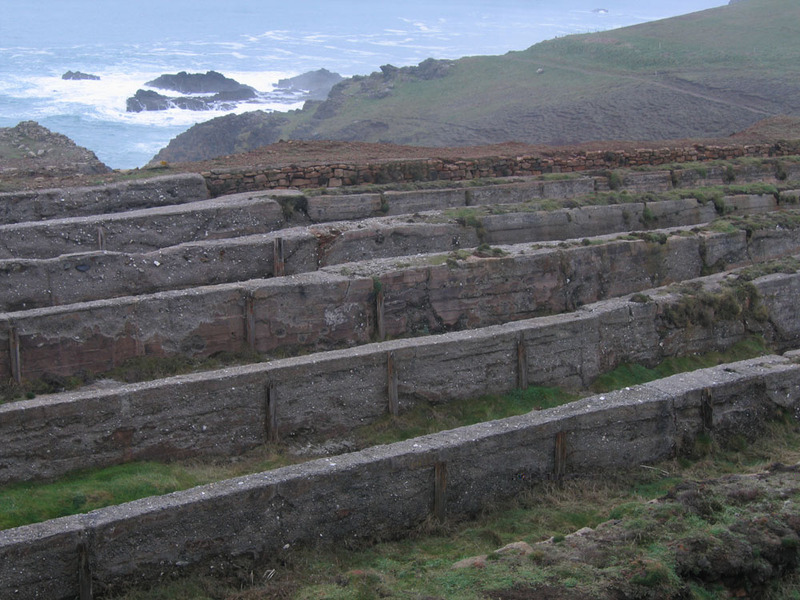 Older man made structures such as burial mounds, also tumbled about by the elements, sometimes stand quite close by, as if all of these constructions are part of one great puzzle. 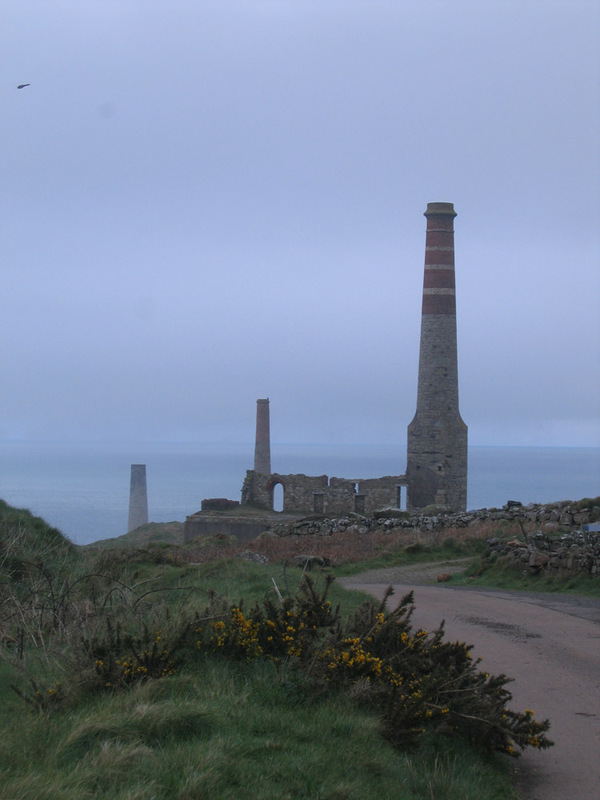 It creates a dramatic, slightly alien and menacing scene, as if a civilisation abandoned its weird cities on the Cornish coast. 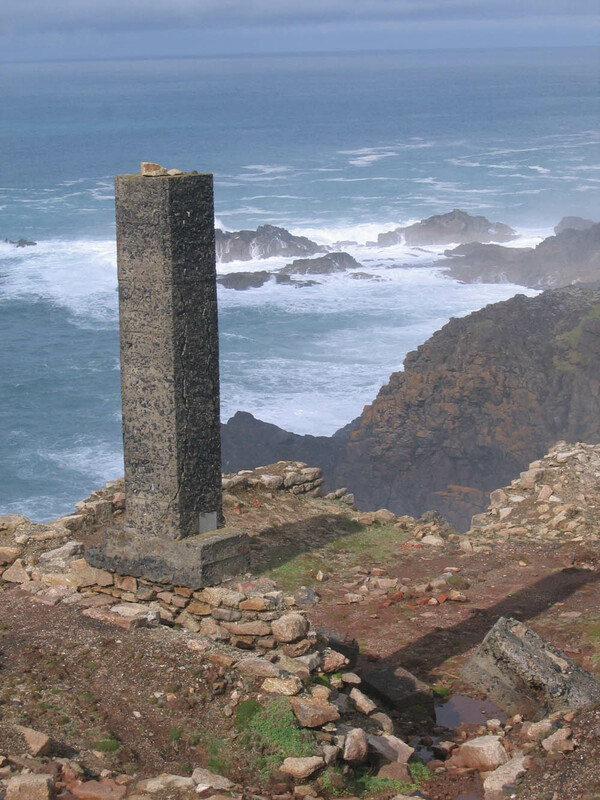 Only the Cornish nature spirits, the Spriggans, are left to skip about amongst the ruins and scare the imaginative and unwary. Many years ago I had an encounter with the Spriggans when staying in an old farmhouse in Cornwall near the sea. A group of us had booked the house but myself and a friend were the first to arrive that winter’s evening. We entered the house, had a quick look round and then, while in the kitchen, heard a sturdy knock on the door. Expecting others from the group had arrived we rushed to let them in, only to open the door into nothing but stillness and dark. We suspected our friends were playing a trick on us so sneaked around the outside of the house hoping to find them in hiding. No-one was about and there was no sign of any car apart from the one we arrived in. Much later, the first of our friends did arrive. We heard the car clearly that time. In the visitors’ book several entries attested to the ‘welcome’ of the Spriggans on first entering the house. 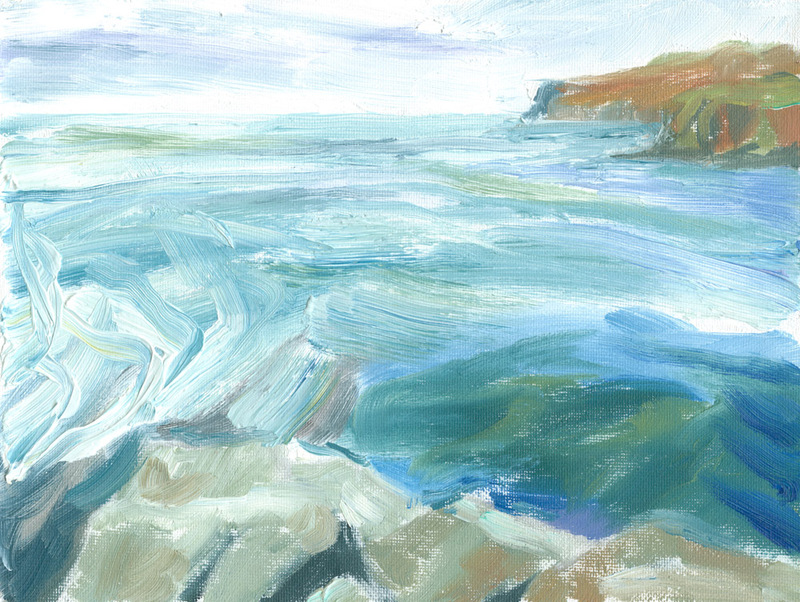 This time we were visiting Cornwall to scour the cliff paths for painting opportunities. I had brought my pochade box and a total of nine canvases in the smaller 6×8 inch size. The end of an eventful 2016 had left me a bit thrown off my painting stride so I was hoping to get back into painting out of doors, which should help to loosen up my slightly rusty skills. 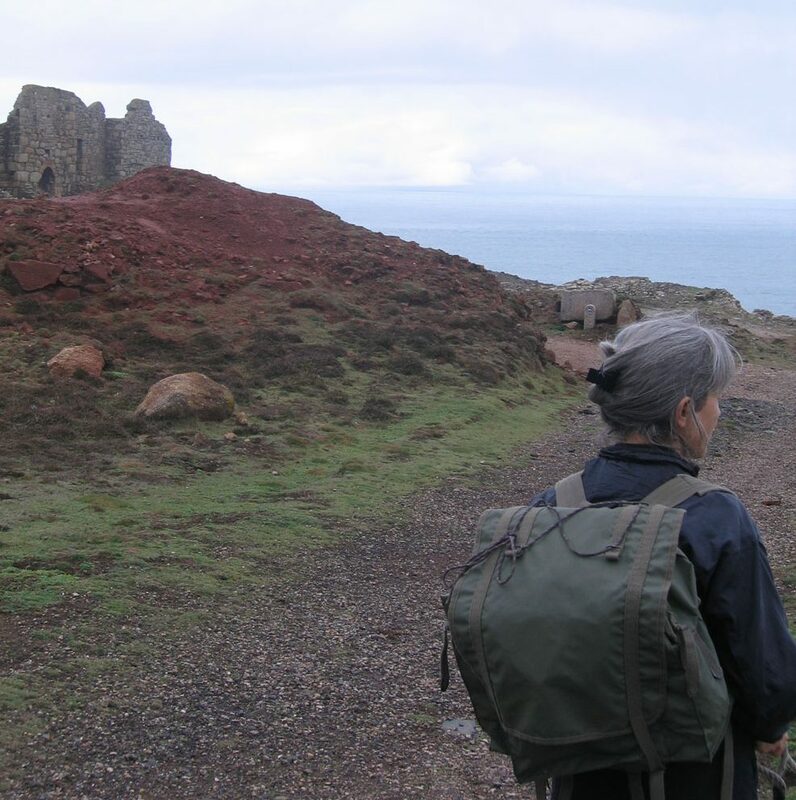 A rocky beach at the end of the valley led to the coast path and cliffs in both directions. Turning south I could walk up onto a narrow ledge path that teetered high over the sea with dark mining tunnels leading deep into the rock. 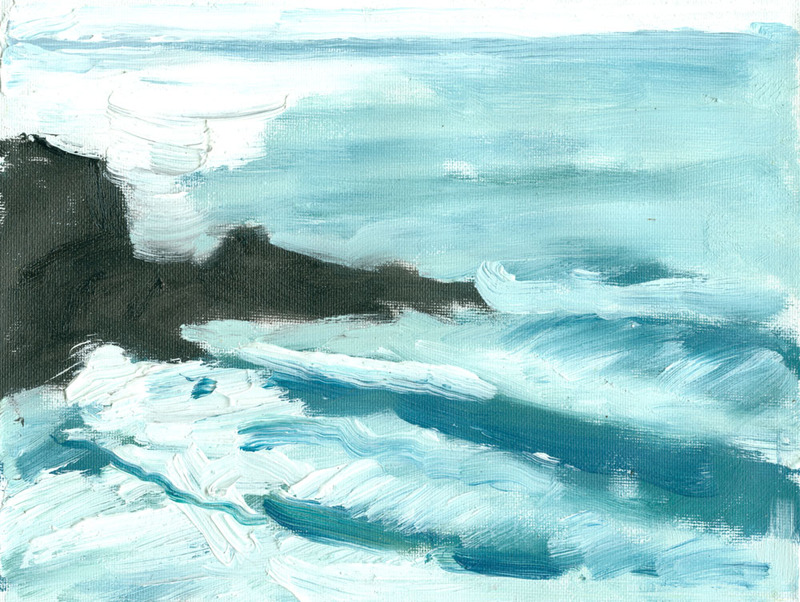 The feeling of foreboding was lifted by flowers growing all over the cliff tops, comical red-footed screeching birds known as choughs and many helpful benches carved out of the rocks, perfect for sitting and staring at the waves crashing below. In the distance two ship-wrecking islands, the Brisons, came and went in the mist, shredding the sea into spray as it cannoned into them. Taking the cliff path in the other direction led up past many mine shafts and an ancient barrow to Cape Cornwall where the waves seemed to be taller than anywhere else. I scrambled down from the cliff edge onto a rock and set up my pochade box, managing two quick sketches before the last light disappeared. I had to hurry back to the house but made it well before dusk settled in. Disappointingly, there were no spirits dancing around the barrow as I passed. 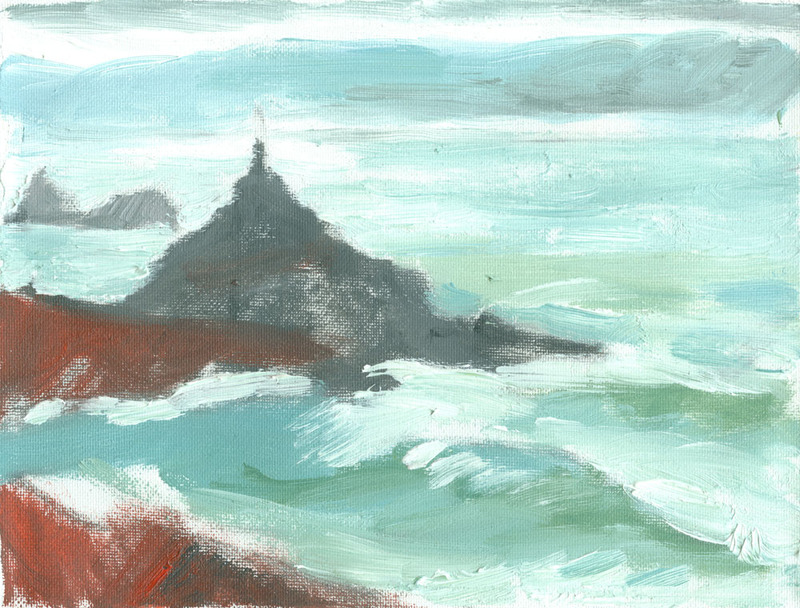 The trip was shrouded in mist a lot of the time so I attempted to paint it. This wasn’t very easy but I thought it was probably good practice for sharpening up my skills. 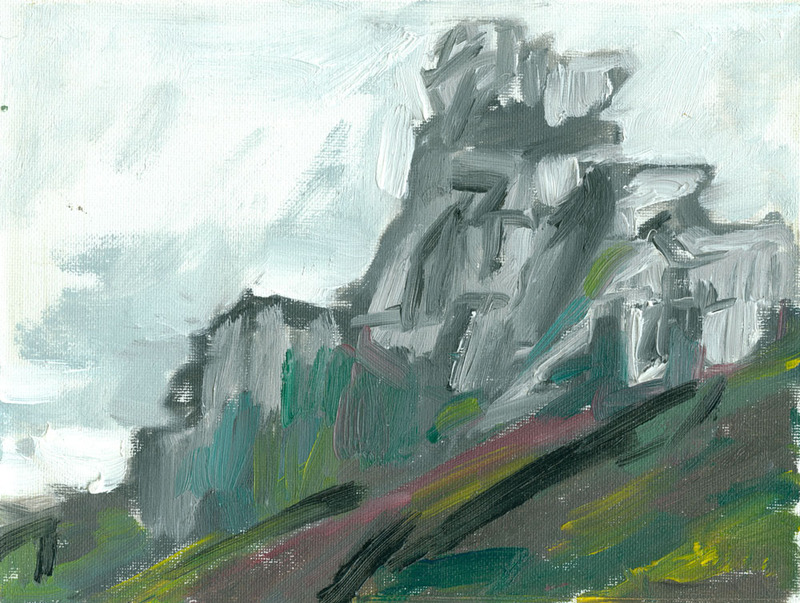 At the end of the holiday the mist became rain but I had become a bit crazed by then and ended up out on a cliff edge trying to shelter behind a rock (horizontal wind and rain gives you more sheltering options) and painted a pile of stones nearby that looked, under the influence of impending hypothermia, a bit like a giant and slightly ominous king sitting looking out to sea. 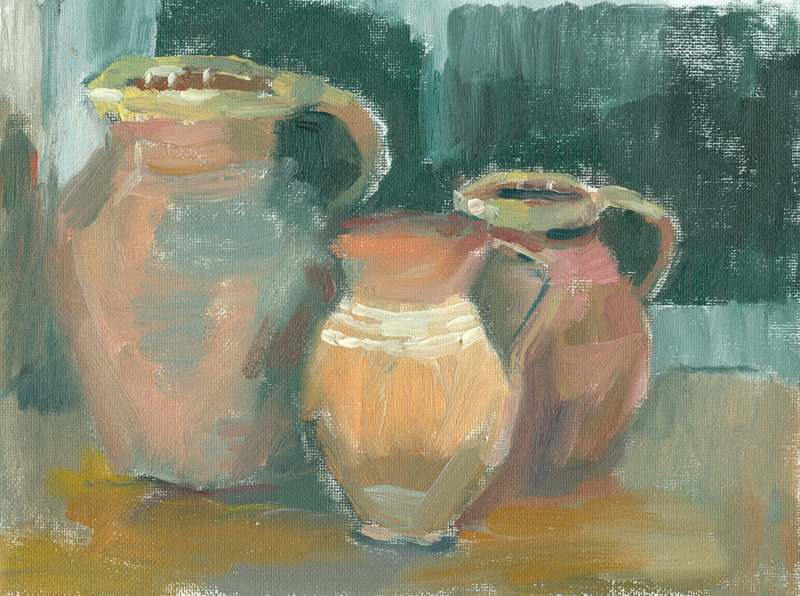 Back at the house it was dark but there were still jugs waiting to be painted, arranging themselves nicely on the windowsill. Now we’re home again I miss being out on the cliffs. But the sea and the peculiar landscape above it will wait for another visit. 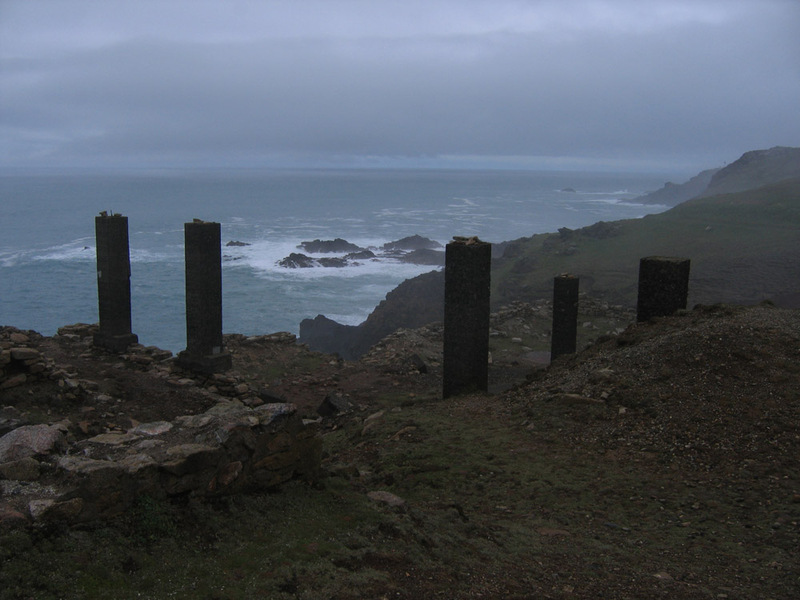 strange modern sculptures on the cliffs or mining remains? 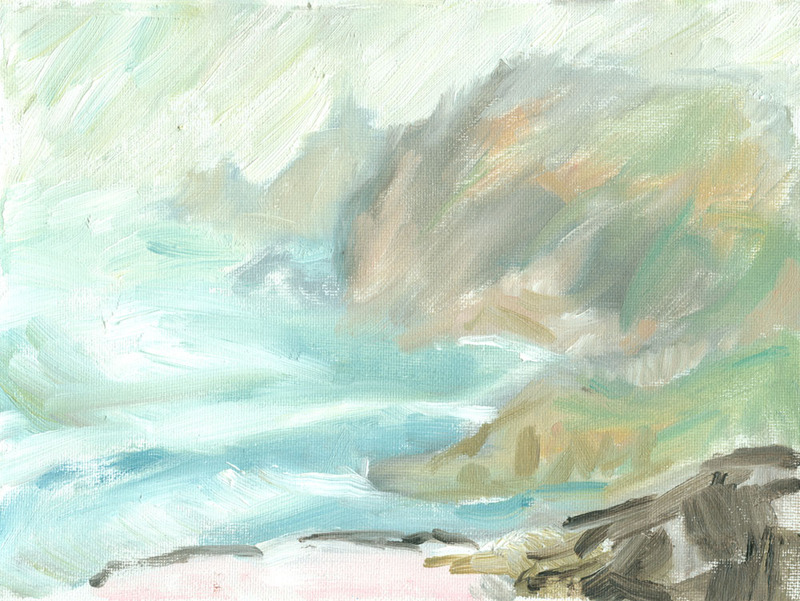 This entry was posted in Cornwall, landscape, paintings, plein air, the sea, walking and tagged Botallack, Cape Cornwall, Cornish coast path, Cornish tin mines, Cot Valley, painting in mist, painting the sea, plein air painting in Cornwall, plein air sketches, pochade box, sea mist paintings, the Brisons on April 25, 2017 by fellpainter.